Google announced on Google+ late Friday that you can now be on Google Maps on your desktop and click "Send to device" on the place card and that will bring up a list of your devices where you use the Google Maps app. So if you have an iPhone, it may show your iPhone. If you have an Android phone, it may show your Android phone. If it doesn't work, you can trouble shoot the issues in this Google Help document. 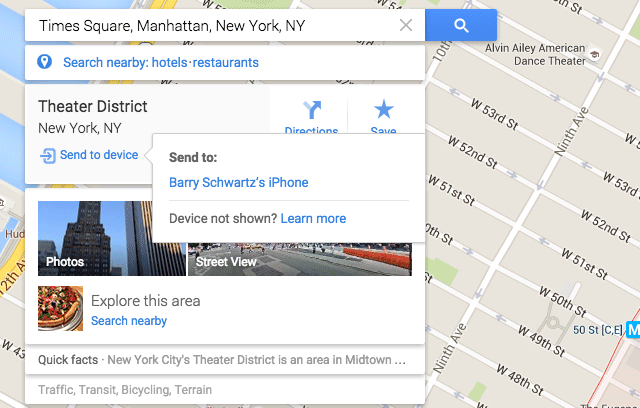 Take your favorite places to go—search for a place on #GoogleMaps on desktop and send it straight to your iPhone or Android device. The picture above shows that it does work for me.